Equipment Rental Unit Enters Into Joint Venture With Dayim Holdings Ltd.
PARK RIDGE, NJ--(Marketwire - February 1, 2010) - The Hertz Corporation (NYSE: HTZ) and its equipment rental subsidiary, Hertz Equipment Rental Corporation (HERC), have entered into a Joint Venture with Saudi Arabia based Dayim Holdings Company Ltd. to set up equipment rental operations in the Kingdom of Saudi Arabia. The new joint venture entity will rent and sell equipment and tools to construction and industrial markets throughout the Kingdom of Saudi Arabia. "The equipment rental market in Saudi Arabia is expanding rapidly, driven by heavy construction and opportunities in the petro-chemical industry. 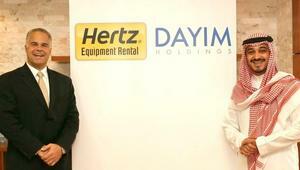 Our joint venture with Dayim Holdings will enable HERC to tap into growth throughout the country," commented Mark P. Frissora, Chairman and Chief Executive Officer, The Hertz Corporation. "With an established presence in the Kingdom, HERC will be able to offer a one stop shop for equipment rental and fleet management needs for this important market." Dayim's Executive Chairman HRH Prince Khalid bin Bandar bin Sultan said: "HERC is a global leader in the field of equipment rental, therefore we believe that it is ideally placed to serve the Kingdom's aggressive expansion plans in all relevant sectors." Gerald A. Plescia, Hertz Executive Vice President and President of HERC, adds, "This was truly a collaborative effort as our HERC teams from the U.S., Europe, and Asia worked closely with the Dayim team to put this important business partnership together. The combined strength of these two organizations will enable outstanding growth opportunities for both and allow us to deliver the highest level of service to those customers in Saudi Arabia." Hertz Equipment Rental Corporation -- a wholly owned subsidiary of The Hertz Corporation since 1965 -- operates one of the world's largest equipment rental businesses, offering a diverse line of equipment solutions from tool and machinery rental to specialty divisions including power generation, industrial plant services, pump solutions and fleet management. Customers range from major refinery operations to large and small contractors and event services companies through approximately 330 locations in the United States, Canada, China and Europe. The Hertz Corporation also operates a highly successful car rental and full service leasing business in Saudi Arabia through its franchise partners The Ali Reza Group. Dayim Holdings was established in 2006 as a vehicle for investment and partnerships in the rapid growth environment of modern Saudi Arabia. It operates and manages its companies in sectors with high market growth potential using a combination of joint ventures, investment and strategic partnership with globally renowned organizations. It is present in a number of sectors including construction, oil and gas, security, IT and telecommunications. The Hertz Corporation is the world's largest general use car rental brand, operating from approximately 8,100 locations in 145 countries worldwide. Hertz is the number one airport car rental brand in the U.S. and at 42 major airports in Europe, operating both corporate and licensee locations in cities and airports in North America, Europe, Latin America, Asia, Australia and New Zealand. In addition, the Company has licensee locations in cities and airports in Africa, and the Middle East. Product and service initiatives such as Hertz #1 Club Gold®, NeverLost® customized, onboard navigation systems, SIRIUS Satellite Radio, and unique cars and SUVs offered through the company's Prestige, Fun and Green Collections, set Hertz apart from the competition. The Company also operates the global car sharing club, Connect by Hertz, in New York City, Berlin, London, Madrid and Paris. For information on Hertz Equipment Rental, visit the company on the web at www.hertzequip.com. To make car rental reservations or for more information, customers can call their travel agent, or call Hertz toll-free at 1-877-437-7320. Information and reservations are also available on the web at www.hertz.com.